Explore UNC-Chapel Hill's vision and strategy for creating a University-wide innovation network. Read about our progress, results and future plans. America’s institutions of higher education have a unique and critical role to play in addressing the most pressing issues of our day. At a time of seemingly insurmountable problems, society turns to universities and asks them to assume greater responsibility for developing new ideas and ways to address important issues. In turn, universities look to their top talent – innovators, researchers, and program leaders – to produce solutions. 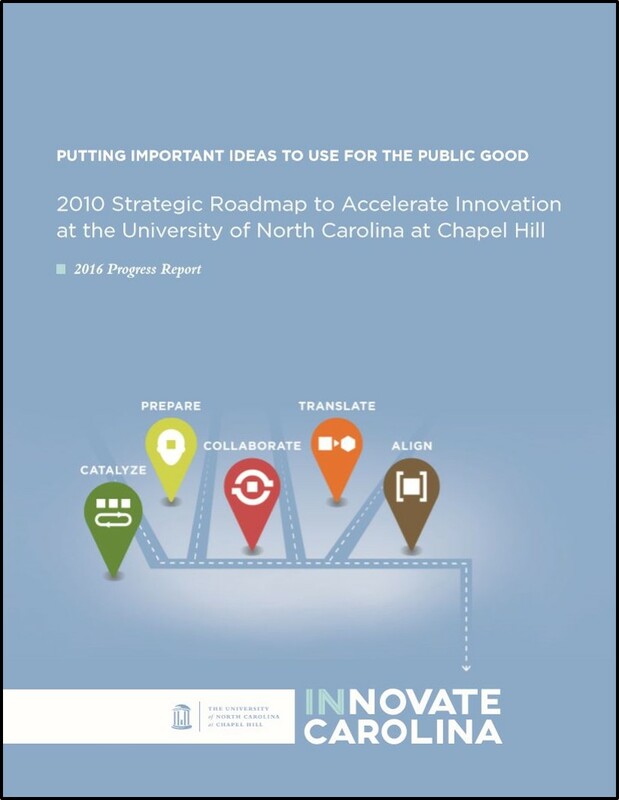 The Innovation Roadmap, initially produced by the Chancellor’s Innovation Circle (chaired by Lowry Caudill) and released in 2010, is UNC’s strategic plan for accelerating the number of solutions and speed with which they are implemented. Since the Roadmap’s first release in 2010, subsequent progress reports have described actions taken, results and next steps. This report is a comprehensive review of the creation and implementation of the Innovate Carolina Roadmap from 2010 to 2016. It includes a detailed account of actions taken, results achieved, lessons learned and future recommendations for advancing innovation and entrepreneurship as a core strategic direction of the University. The 2012 Progress Report outlines the steps taken toward the recommendations and goals described in the Roadmap. It reflects what was learned in the implementation process and outlines the work that remains. 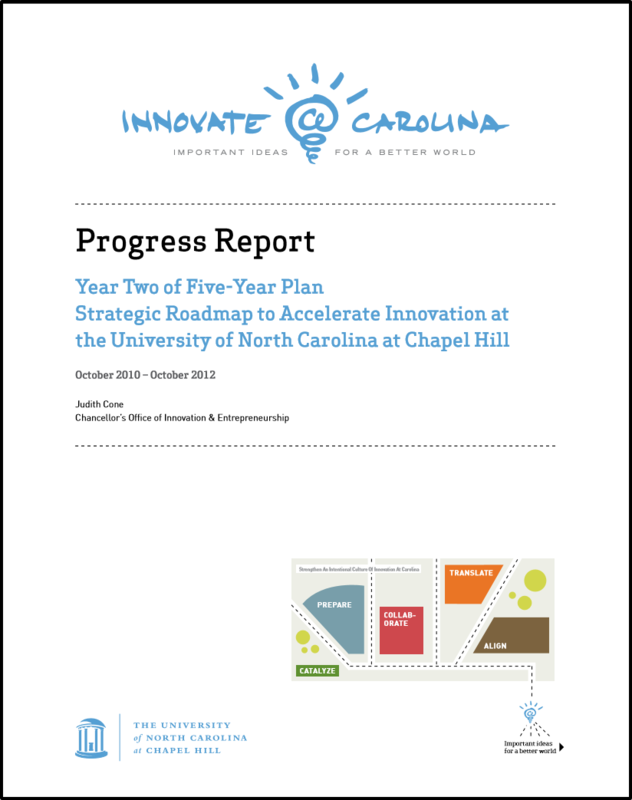 The 2010 Roadmap describes a strategy to increase the speed and number of innovations coming from UNC-Chapel Hill. It provides a foundational guide and looks systematically at the entire campus to find ways for faculty, students, staff and the greater Carolina community to translate their ideas into innovations affecting a wide range of issues. 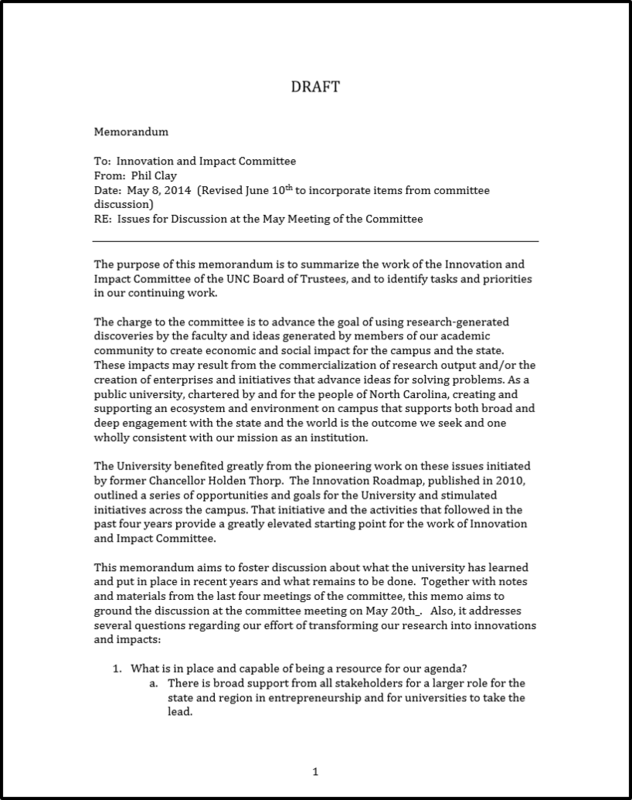 This paper responds to the questions posed to the Administration by Board of Trustees’ Committee on Innovation and Impact Chair Phil Clay in his memorandum of June 10, 2014, which presented these questions: What actions have been taken to date? What have we learned? And what remains to be done? 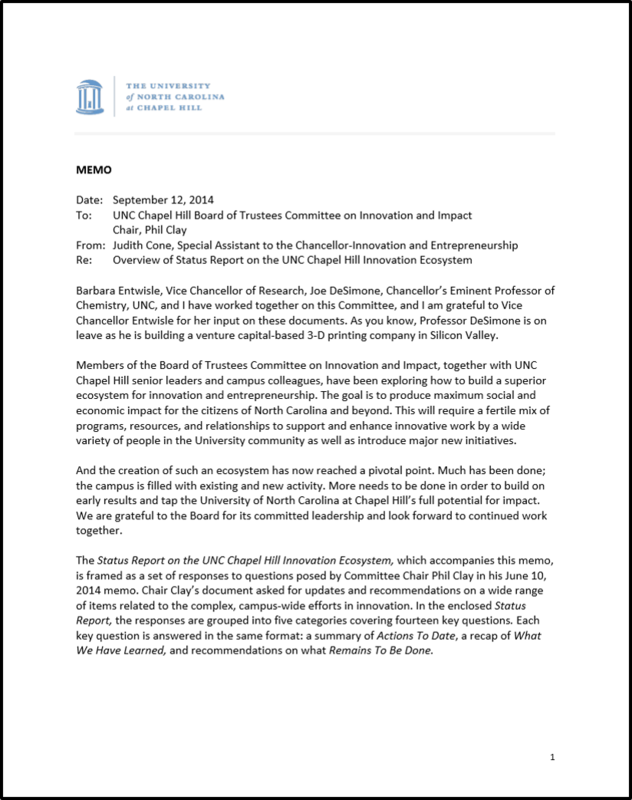 This memo provides a brief on the full Status Report on the UNC-Chapel Hill Innovation Ecosystem from 2014, which responds to the questions posed by Committee Chair Phil Clay in his June 10, 2014 memo. 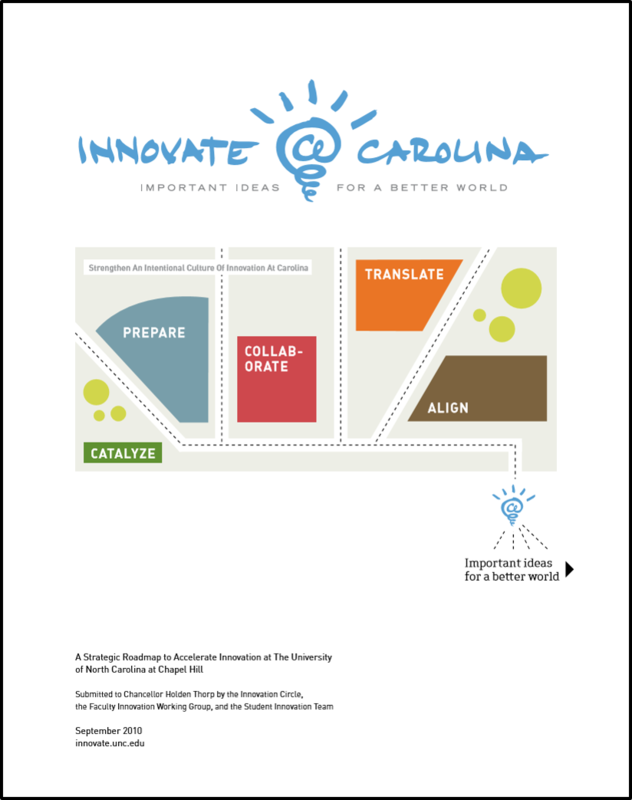 It outlines the nature of the innovation work at Carolina, where it stands, major priority areas and forward-looking directions. 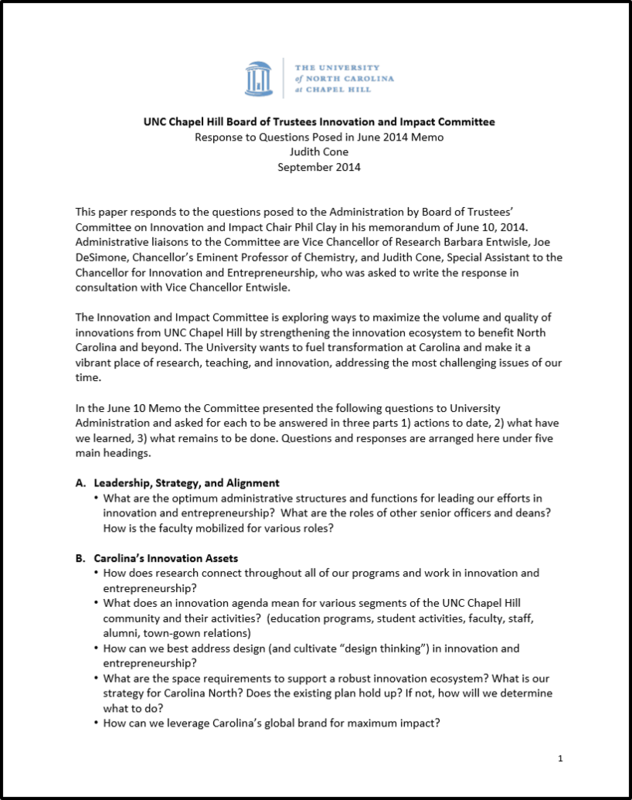 In this memo from June 10, 2014, Phil Clay, chair of the Board of Trustees Innovation & Impact Committee, asked for updates and recommendations on a wide range of items related to the complex, campus-wide efforts in innovation at UNC-Chapel Hill. In 2009, former Chancellor Holden Thorp asked a group of volunteer alumni, parents and friends of the University to serve on the Innovation Circle to help determine Carolina’s strategy for innovation and entrepreneurship. This landscape study served as a primer for those discussions by providing a 2010 snapshot of innovation at UNC-Chapel Hill. Physical spaces on a campus reflect a university’s history, personality, priorities and future direction. 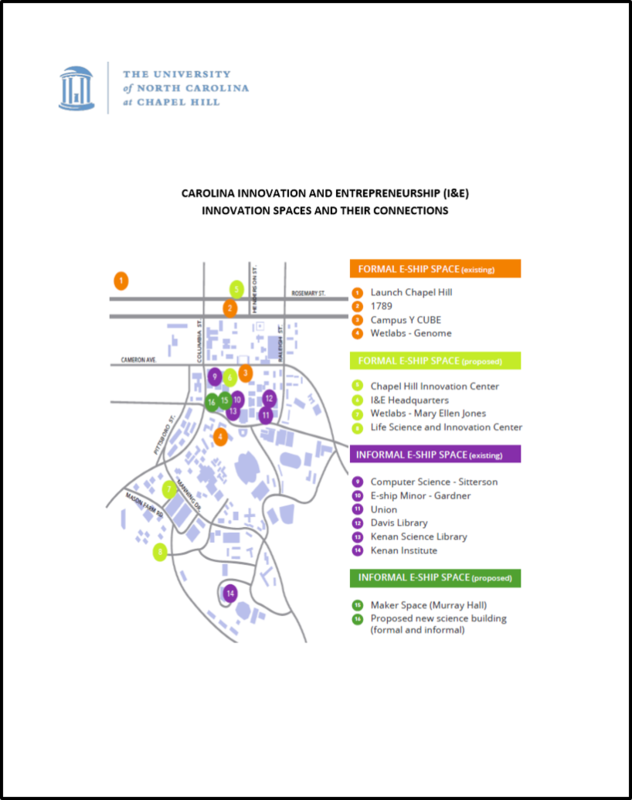 This report presents the near- and long-term requirements for an innovation and entrepreneurship ecosystem at UNC-Chapel Hill where students, faculty and staff can imagine, design, build and grow ventures to solve pressing challenges. 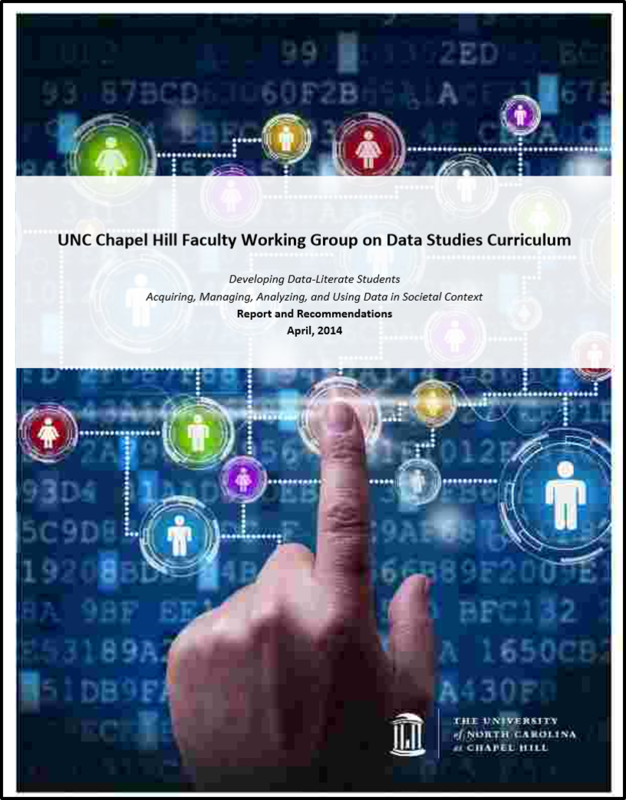 This report presents the work of the UNC-Chapel Hill Faculty Working Group on Data Studies. It includes recommendations for preparing Carolina graduate and undergraduate students to be data literate, so they can increase their competencies for academic pursuits, raise their competitive advantage in the marketplace of ideas and jobs, and increase their translational skills. This progress report details the work, research and recommendations of the Commercialization Task Force, which was charged to develop an integrated strategy and plan for the commercialization of technology at UNC-Chapel Hill. It explores the faculty perspective, the student experience and the commercialization process at Carolina. This report was submitted by the Task Force on Enhancement of Industry Relations and Industry‐sponsored Research Funding to the Vice Chancellor for Research. It describes five recommendations for improving university‐industry partnerships at UNC‐Chapel Hill. In 2014, the Committee on Innovation Spaces submitted a report of its findings to the Provost. In 2014, the Faculty Working Group on Data Studies submitted a report of its findings to the Provost. In 2013, a task force on industry relations submitted a report of its findings. 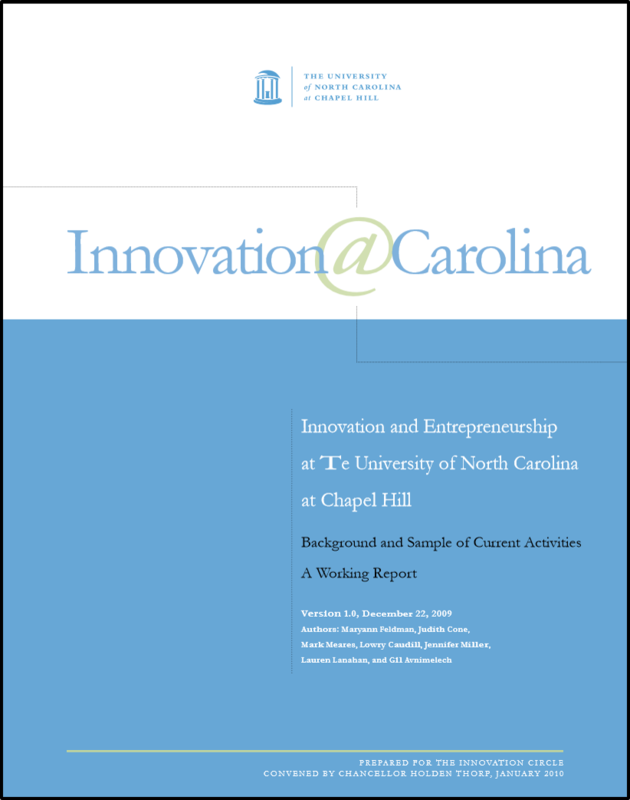 In 2010, Innovate Carolina submitted a study of activities to the Innovation Circle.